As the year draws to a close the incidence of formal occasions increases. Celebrations range from end-of-year functions, awards nights, to black-tie weddings and such affairs. There is something to be said for a black-tie occasion: better calibre, better company, and better catering. Formal events come with the responsibility to dress the part. Gone are the days where is the dress code is flouted for lack of knowledge or imagination. We gentleman must take the lead to suit and boot in the finest possible way. A rented tuxedo is not enough; ill-fitting, poor fabrics, and not to mention the legions who have worn it before, it's not a particularly appealing proposition. Every gentleman should own at least one dinner suit for whatever formal occasion might crop up in his life—weddings, parties, anything. 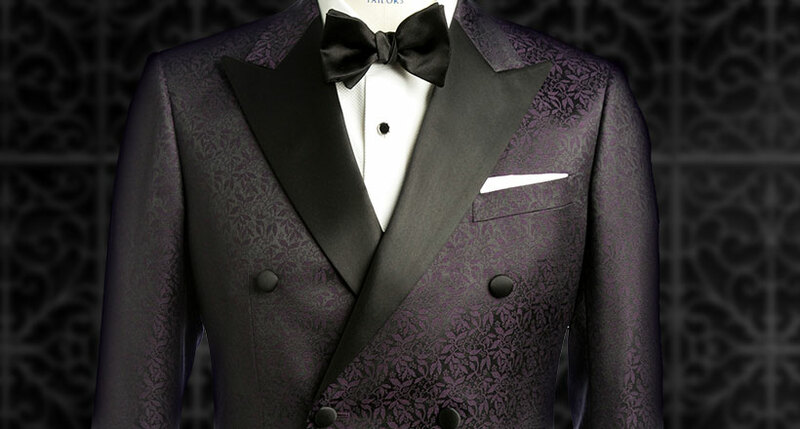 A tailored dinner suit is the solution as it will weather the years to welcome celebrations time and again. A classic and tailored dinner suit in traditional black can do no wrong. The single-breasted option is the safest, offering security from passing trends. Usually with a shawl lapel, it's simple, sleek, and always dandy. A double-breasted jacket with wingtip lapels is more adventurous, and gives you an incredible sense of strength and form when wearing it. Both styles have satin lapels, an elegant feature associated with formalwear to differentiate a dinner jacket from a standard blazer. "Formal events come with the responsibility to dress the part"
If you wish to stray from the norm, there are multiple options available. Consider a patterned formal fabric such as silk to liven up the affair. There are many jacquard and printed fabrics available for an extra-special touch. Think subtle checks, beautiful brocades, elegant polka dots and abstract geometry. Paired with a black satin collar, these options can cut quite a figure. Or if velvet is more your thing, consider a contrasting blazer in a colour such as burgundy, marine, French navy or black. The texture of velvet adds an extra dimension, and formal affairs are where one can truly appreciate the sumptuous nature of such a fabric. Of course, trousers factor into the overall design of a dinner suit. You can choose whether to stripe the sides with satin or grosgrain ribbon, or leave them plain. It's personal preference and there is no hard-and-fast rule about which is the most appropriate. Finally, let accessories speak. While black tie dictates the neckwear, choose the colour of your bow tie to suit your own tastes. You can also experiment with a pocket square, a lapel pin, a silk evening scarf, or formal cuff links. Or perhaps give a cummerbund a go—it’s slowly reappearing as a fashionable option.